After almost 2 months I made a dessert. And that too something from myown blog with a bit of change to the original recipe. There is also a step by step pictorial. Not that I had to make any thing new for posting here as I have so many pending pictures and recipes for posting. As you all must have noticed I am still not visitng the blogs I used to visit regularly before my life was turn upside down. I once in a while and I mean once in while I go to a blog. I think I must have gone just to few blogs in total, not that I don't want to visit , just that I don't have the patience to visit and write a comment, I am sure in time I will get back to my regular bloghopping. Bring the water to boil in a pan abd add the orange peel, vanilla essence, sugar and bat leaf and poire williame. Preheat the oven to 200°cNow take the pastrt sheets and cut them into pear shapes ( shown in the pic). In the original recipe you make a chocolate sauce from the syup. But this time I just MW 100 gm of chocolate with a bit of milk and poured over the tarts. Wow..Superb tart.Drooling to have some.Nice recipe and classic presentation ! Wat an elegant and inviting tart, very gorgeous dessert..
Beautiful tart. Take your time Finla and all the best. They look delicious Finla. Take your time and best of luck and best wishes. Super awesome, gorgeous dessert! I bet it was delicious! This looks great! Don't worry, sweety! Just take good care of yourself! Hugs. i SO much heart those pear tart moreover choc sauce! beautiful presentation and it looks very tempting and delicious!! 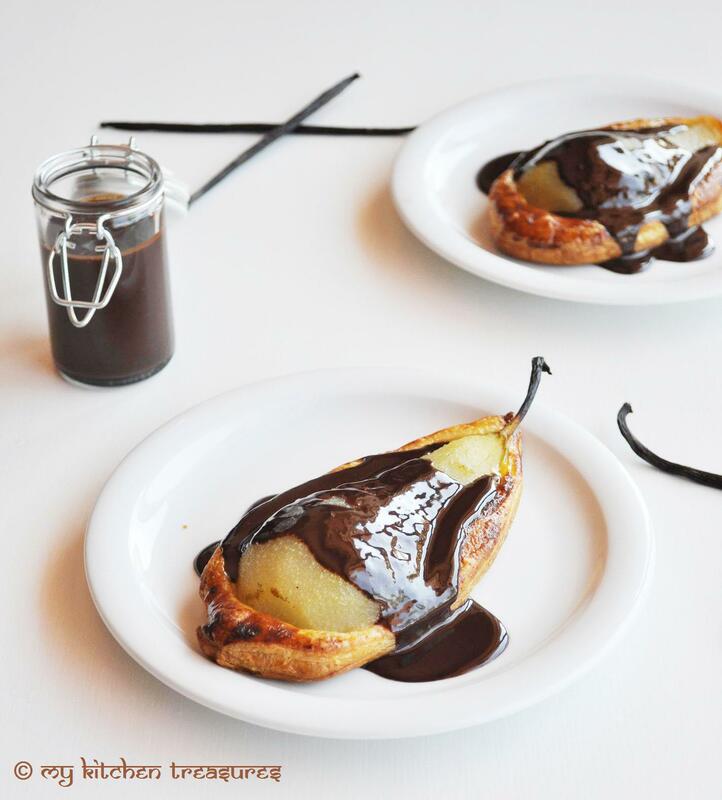 That's a brilliant idea of filling the whole pear in the pastry. Look so luscious and tempting! Mmmm, pear and chocolate - delicious. Take your time F- not easy to blog hopping in difficult time. Ur dessert is always fascinating! such a tempting tart...I am drooling! Oh I love this kind of tart! They look beautiful Finla. This is so, so lovely! 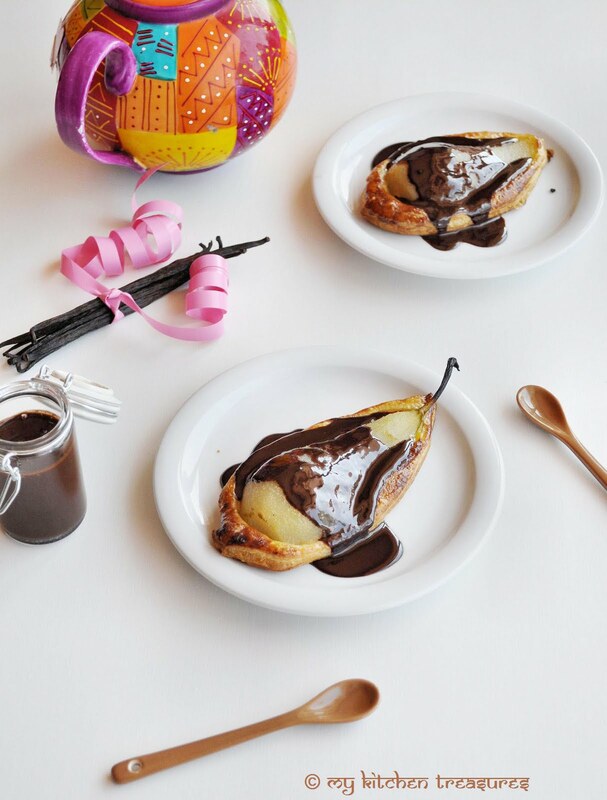 I adore pears, and really this is all just good things packed into a good pastry and topped with chocolate. The first pic looks colorful and pretty! The tart looks amazing! This looks awesome and does not seem that difficult to make. I will give this a shot once the pears in my back yard are ready!